Sylvain Kalache is co-founder of Holberton School, a two-year program training highly skilled full-stack software engineers at scale. An entrepreneur and software engineer, he has worked in the tech industry for more than a decade. He has written for CIO and VentureBeat. Artificial intelligence is all around us. It’s in our cars, our homes and our pockets. IBM is teaching Watson to understand, reason and even to learn — helping to translate information into knowledge that can help drive more informed decision-making in medical care. Leading tech companies ship AI free within their products (Siri, Alexa, Google Assistant), powering our phones and the rapidly growing home personal assistant market. Indeed, they are becoming increasingly good at answering our questions, making us smarter. With all this information, this intelligence, at our fingertips and lips, shouldn’t our educational system catch up? Teaching not rote facts and figures, but instead teaching students the paths to find this knowledge on their own. Teaching students — as we do with computers through AI — how to learn. Unfortunately, our education system isn’t keeping up. We are stuck with centuries old methodologies, where schools and teachers act like the gateway to knowledge, but at a time when students can access all they want by simply asking Alexa. Finland understood this change and decided to get rid of the passive learning education and lecture format. Instead students are working in groups on topics of their choice, practicing problem solving. Teachers guide students as they are learning on their own. Flexibility and the ability to retrain will be key for workers of tomorrow. The World Economic Forum estimates that 65 percent of children entering primary school today will ultimately end up working in completely new job types that don’t yet exist. Computer-assisted “human intelligence resides in the cloud” and, actually, “all of us are bionic these days,” even if we don’t know it. Our natural senses and functions are supplemented by computers and mobile phones (which relieve our brains of some of their data storage and processing burdens). AI is making us smarter. It helps humans get and process information in ways that humans on their own cannot. Today’s goal for AI trainers is to reach singularity, a state where the algorithm will be able to learn by itself. A few decades ago when we were looking for a piece of information, we had to go to the library and ask the librarian or consult the book index. Then we had to find the book and hope that it contained the information we sought. Not to mention all the hours spent combing through microfilm (and microfiche). Today, just ask your personal assistant and the answer will be delivered to you in seconds. But sometimes personal assistants are not smart enough yet to answer, and humans need to go back to search engines — that’s where being trained on self-learning becomes really important. It is actually hard to frame the right request to the search engine, pick which links look promising and then decide which piece of information is right. Sorry if I shock some of you when I say this, but “it’s on the internet so it must be true!” is a lie. The AI sector is booming, powered by the mix of cheap computing power coupled with gigantic amounts of data. This new engine allows engineers to successfully train neural networks at the heart of deep learning, the engine of AI. 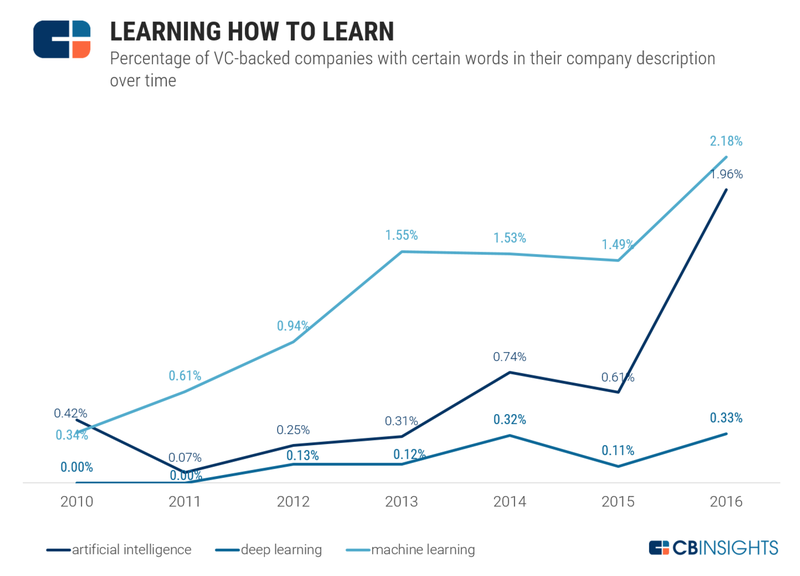 According to CB Insights, already 2 percent of current VC-backed companies are working on training AI algorithms. “Learn how to learn” captures very well the challenge that these startups have to overcome: get these artificial brains to learn from the massive amount of all the data easily accessible today. Since Homo sapiens created our first tools, we’ve continuously used new technology to do our job better. Sometimes the technology even takes over completely. Workers constantly have to adapt to change. But now, our world is changing at a pace faster than we’ve ever experienced before. Today’s goal for AI trainers is to reach singularity, a state where the algorithm will be able to learn by itself — resulting in a powerful super intelligence. But until this happens, our society needs to adapt to train the most powerful intelligence: humans. And training highly flexible workers who are able to retrain and take advantage of new technologies is critically important, as the World Economic Forum reported: “Creativity will become one of the top three skills workers will need. With the avalanche of new products, new technologies and new ways of working, workers are going to have to become more creative in order to benefit from these changes.” Let’s disrupt education and provide a recipe that is training workers for the 21st-century needs.